Steady heavy rain fell all morning, so I delved into my photographic archives and scanned another batch of Streets of London colour slides made in May 2008.
to Kensington High Street in W8. 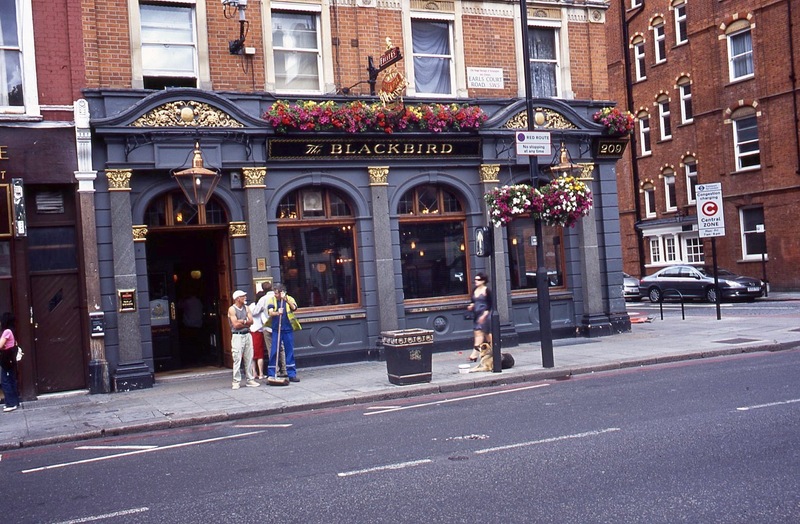 The Blackbird pub, almost opposite Earls Court Underground station, was previously a branch of the Midland Bank. Currently closed for refurbishment, it was converted to a Fuller’s Ale and Pie house in 1994. It would be fun to speculate on the conversation taking place outside. 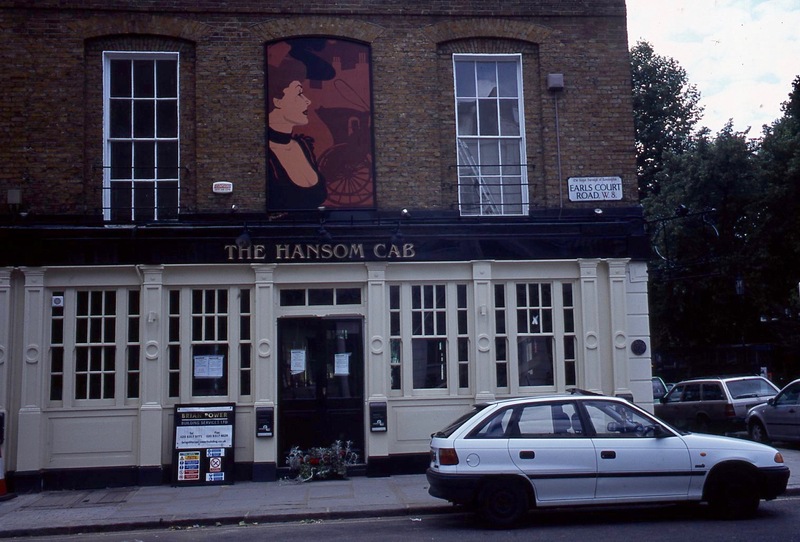 The Hansom Cab, now specialising in craft beer, has been operating on this site since 1827. 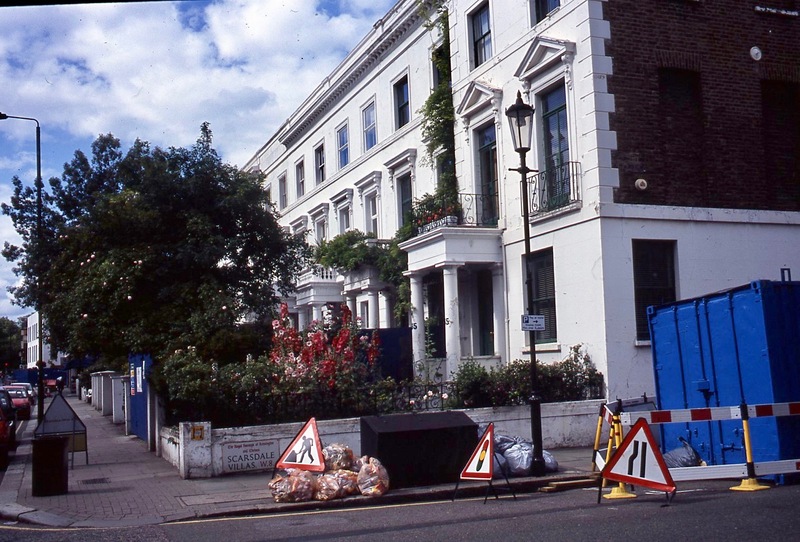 A little further along, on the corner of Pembroke Square W8 lies Rassell’s up-market garden centre, which has rather mixed reviews. 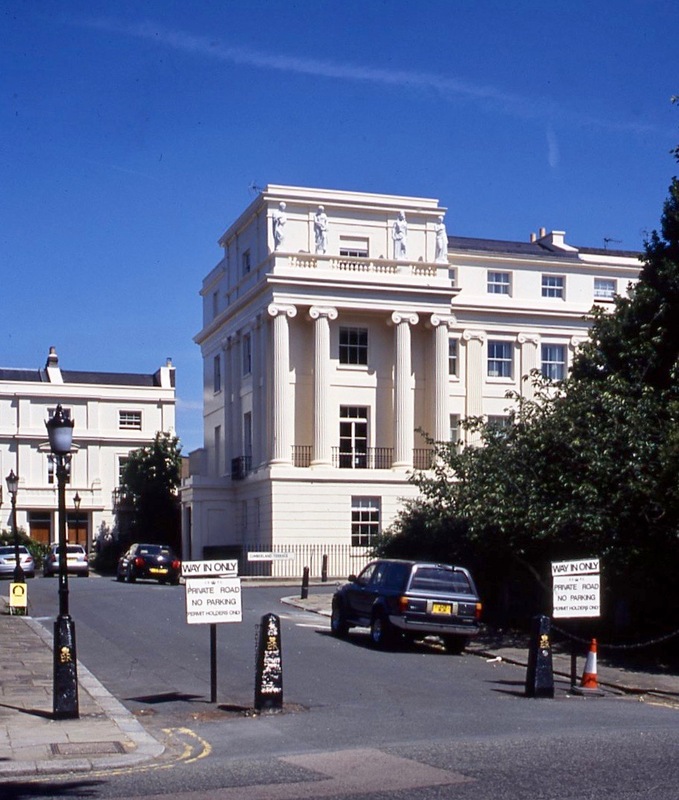 Immediately opposite Pembroke Square lies Scarsdale Villas W8. 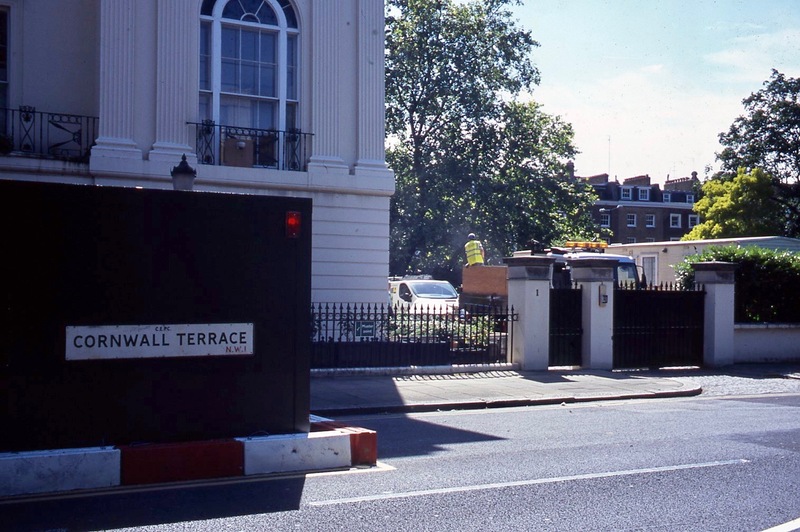 Trebovir Road SW5 is very close to Earls Court Underground Station. 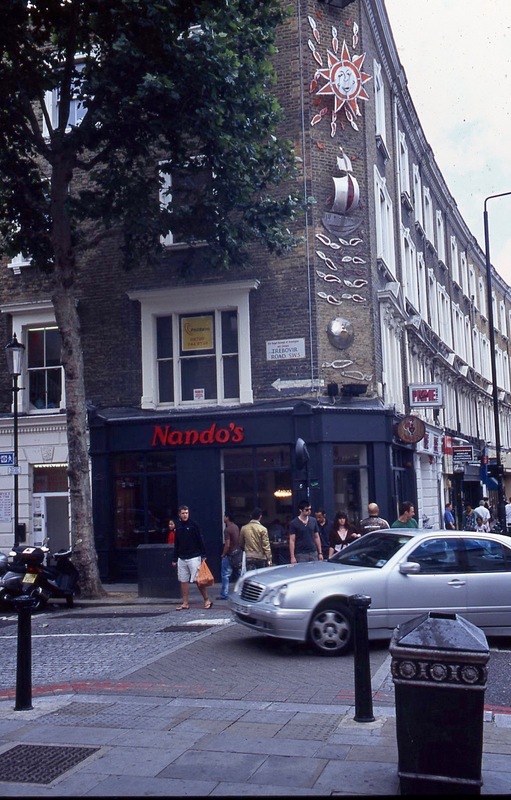 Nando’s, started in South Africa, in 1987, now operates 1,000 outlets in 30 countries. Its speciality is peri-peri chicken. 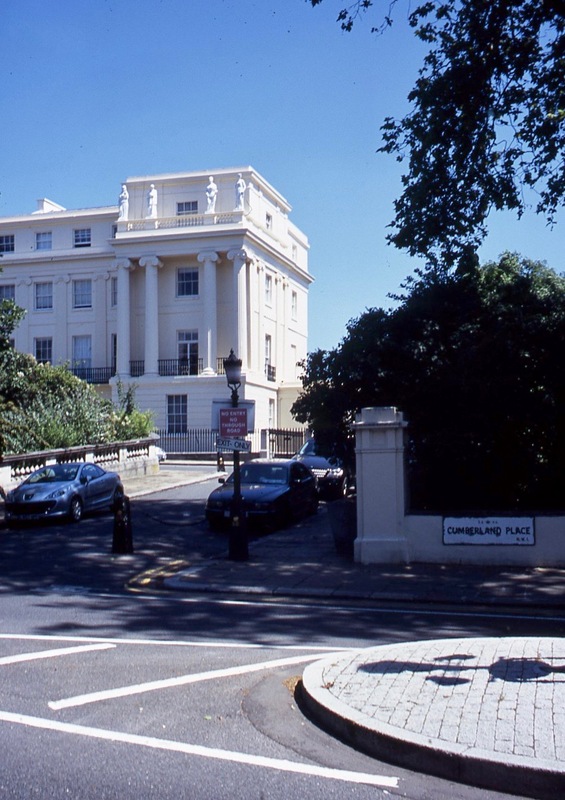 and Cornwall Terrace NW1 both lie alongside The Outer Circle of Regents Park. 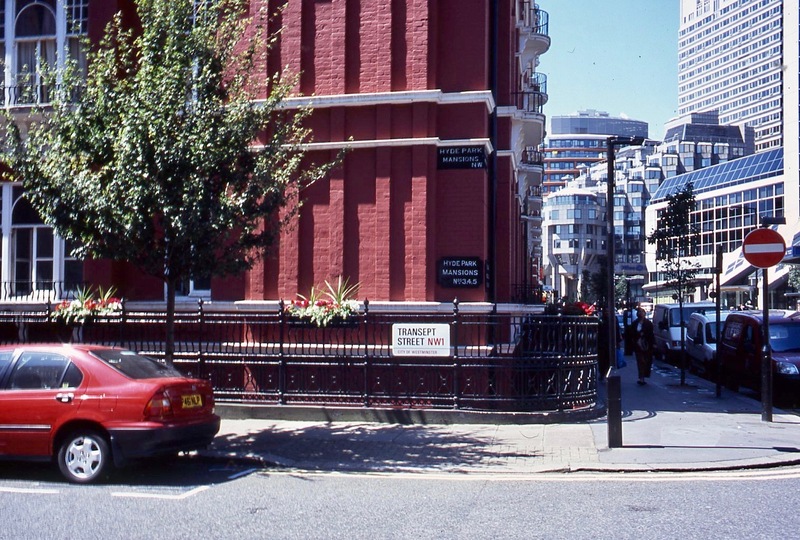 Transept Street NW1 crosses Chapel Street beside Edgware Road tube station. Inverness Street Market NW1, a more quintessentially English example, established around 1900, is tucked away from the high street. This afternoon we visited New Milton to collect items from the dry cleaners, and to deliver more kitchenalia to the Oakhaven Hospice Shop. They had been unable to take my Epson printer, complete with spare, unused ink cartridges, but suggested that the Mind shop might, because they had a tester. They couldn’t. There was no alternative but to offer it to the sales area in the local dump, now known as a recycling centre. They were not allowed to receive the printer, but could accept the inks. I was directed to carry the machine over to the container dedicated to such goods. The man in charge of this spoke of the culture of fear of legislation which now dominates us. While we were conversing, a woman brought a pair of pristine looking crutches she had not been allowed to return to an NHS hospital. My printer was about seven years old. It had been used once or twice only; its last six years having been spent in bubble wrap in a cupboard. I do all my printing on the Canon A3+ model, but, had I been so inclined, I could have printed all today’s images on the device I could not give away. Our next stop was Otter Nursery where we collected a flat-packed wooden arch for Aaron to assemble on Sunday. Elizabeth was out this evening. Jackie and I dined on Mrs Knight’s hot and spicy pasta arrabbiata, with which she drank more of the Chardonnay and I finished the Malbec. 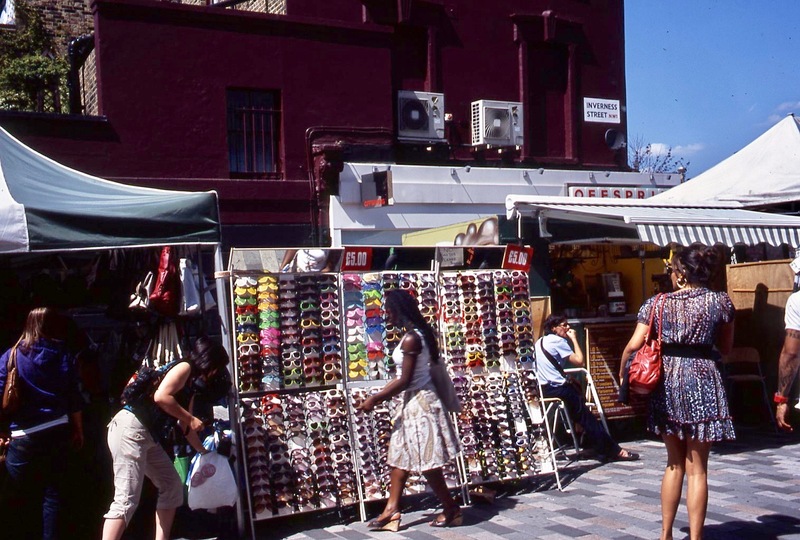 This entry was posted in Uncategorized and tagged Camden High Street, Camden Market, Cornwall Terrace, Cumberland Terrace, Earls Court Road, Epson printer, Inverness Street Market, Nando's, Pembroke Square, Scarsdale Villas, The Blackbird Pub, The Hansom Cab, Transept Street, Trebovir Road by derrickjknight. Bookmark the permalink. I’ve never been to London, so your pictures are a real treat. I love the look of the Blackbird. It reminds me of the street level of some beautiful buildings from that era in Seattle and also in Victoria, BC, Canada. I don’t usually take pictures of buildings, but maybe I should think about it. Isn’t it a shame that there’s no way to give away old printers and computers, even when they’re perfectly serviceable? I don’t update as often as some people. I wonder what they do with their leftovers. Thanks very much, Nicki. I’m pleased you like the tour. I hate throwing stuff away that someone else could use. The Blackbird Pub looks charming–at least on the outside. Another fun London tour! That’s too bad about the printer. Your slides scan superbly. Natural wear and tear have wrecked a whole lot of mine. I cannot believe it that you were unable to sell or even give away a perfectly good printer. And those crutches! The legislation involved is more seriously sick than any patient could be. Quite so, Leslie – it’s not actually legislation, but fear of being sued in the case of electrical goods, and administrative costs in the case of hospital equipment. Thanks very much. Thanks very much, Rupali. 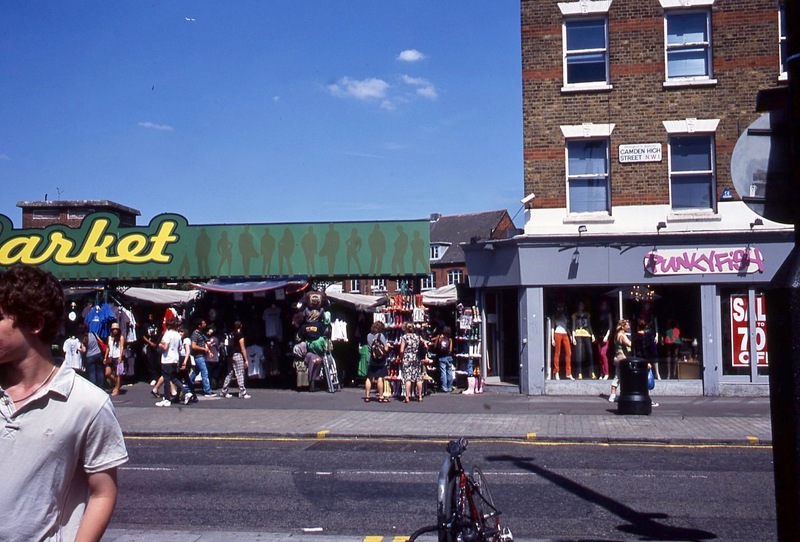 London changes all the time – better or worse probably depends on one’s perspective. Thank you for tasking on this journey with you Derrick. Sadly, the pub is probably making more money than the bank ever did. I always love your floral posts, but I adore the sight seeing trips. I would have taken the printer here in the US and said thanks. Our local rubbish dump has a lot of recycling bits and also places where you can take anything you’d like. There is also a local synagogue that has a yearly yard sale and would likely take something like that, although i think they are cautious with used electrconics. My son and his wife just went to London! I would love to go someday. The little tours you take us on our wonderful! Excellent pictures of our great capital city. I have experience myself of having to dump perfectly usable items. Medical items, such as mobility aids, in particular will not be taken back by the NHS for re-use. Thanks very much, Roland. Interestingly, my knees are being treated in a small private hospital under the auspices of NHS. They are quite happy to receive returned walking aids. I love how so many of the storefronts have flowers around the windows. Thanks again for taking us to the streets, Derrick…it’s always a pleasure! 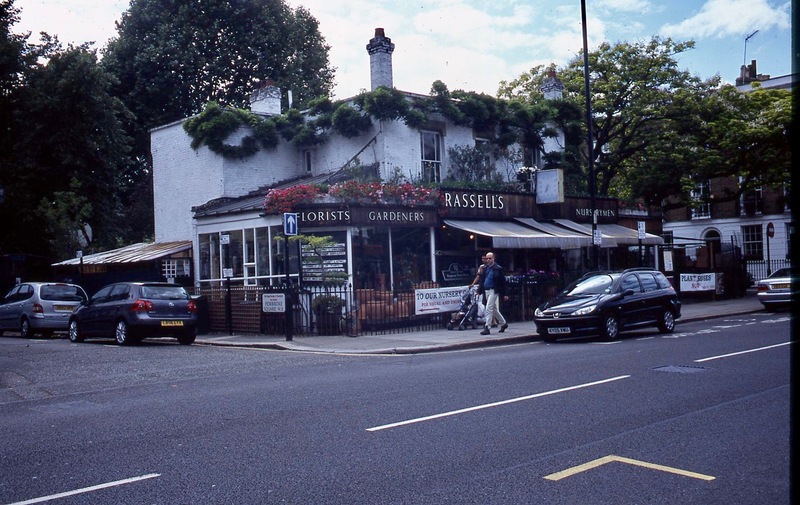 The Blackbird, the Hansom Cab and Russell’s Florist and Gardening shop all looked really beautiful! Your photographs could be on book or magazine stories, Derrick. I am sure your memoir is making great strides! Take care, my friend and hope you will have a fantastic weekend with Jackie and family. I was hoping you would find clarity as you progressed along. This would be my worst possible situation that once I started a book (memoir or novel) I would come to a standstill. Hmmm. . . time will tell and maybe a dream or insightful thought will break through the “crossroads.” I believe this will possibly meander or percolate inside your head. Best of luck, Derrick! You can find your direction to head, I believe. The weird legislations is a kind of dystopian nightmare come true. Those are very engrossing images of London. Ironically our Nando’s here in Geelong West, has recently been shut down, very much out of flavour in our district. A great little tour derrick. Historically quaint! Ah what to do with all our junk printer and computer components – our town will cart away to someplace for free. We are very lucky. Thank you for taking me somewhere I’ve never been…via your beautiful photos! It is kind of you and Jackie to make donations. Seems some places are a lot pickier today about what they will accept. 😦 We donate money and items here and rarely are things turned away. And if they are, I search out an individual that might want the item. Sunny in London! At least when you took those pictures. That’s terrible about the printer. You certainly tried to find a good home for it. Sigh. Yes, Gumtree or Ebay. I’ve sold a bread maker on the latter. There are charity shops in Leeds which would take them, as they do have PAT testing. Not that that helps you. However, the council would now salvage rather than dump useful parts (if it is any consolation) and you could in future advertise on Freegle. Thank you for the streets of London tour, Derrick. perhaps someday I’ll visit there. Sorry about the printer. Recycling and reusing equipment go a bit easier over here. Hope you find a home for the printer!